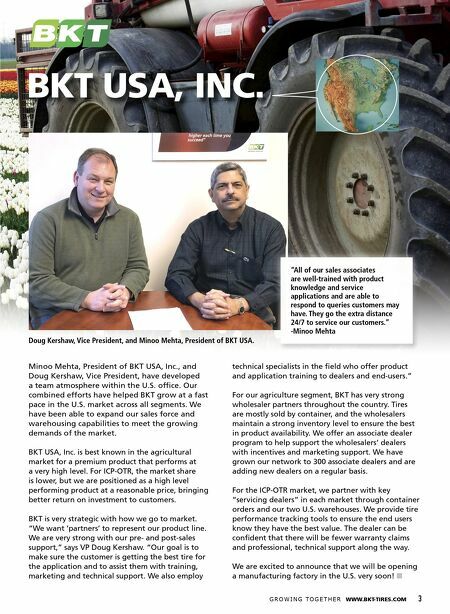 3 G R O W I N G TO G E T H E R WWW.BKT-TIRES.COM Minoo Mehta, President of BKT USA, Inc., and Doug Kershaw, Vice President, have developed a team atmosphere within the U.S. office. Our combined efforts have helped BKT grow at a fast pace in the U.S. market across all segments. We have been able to expand our sales force and warehousing capabilities to meet the growing demands of the market. BKT USA, Inc. is best known in the agricultural market for a premium product that performs at a very high level. For ICP-OTR, the market share is lower, but we are positioned as a high level performing product at a reasonable price, bringing better return on investment to customers. BKT is very strategic with how we go to market. "We want 'partners' to represent our product line. We are very strong with our pre- and post-sales support," says VP Doug Kershaw. "Our goal is to make sure the customer is getting the best tire for the application and to assist them with training, marketing and technical support. We also employ technical specialists in the field who offer product and application training to dealers and end-users." For our agriculture segment, BKT has very strong wholesaler partners throughout the country. Tires are mostly sold by container, and the wholesalers maintain a strong inventory level to ensure the best in product availability. We offer an associate dealer program to help support the wholesalers' dealers with incentives and marketing support. We have grown our network to 300 associate dealers and are adding new dealers on a regular basis. For the ICP-OTR market, we partner with key "servicing dealers" in each market through container orders and our two U.S. warehouses. We provide tire performance tracking tools to ensure the end users know they have the best value. The dealer can be confident that there will be fewer warranty claims and professional, technical support along the way. We are excited to announce that we will be opening a manufacturing factory in the U.S. very soon! n BKT USA, INC. "All of our sales associates are well-trained with product knowledge and service applications and are able to respond to queries customers may have. They go the extra distance 24/7 to service our customers." -Minoo Mehta Doug Kershaw, Vice President, and Minoo Mehta, President of BKT USA.